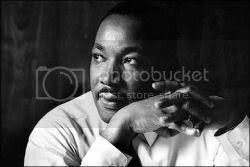 In a poignant essay published in today's Raleigh News & Observer, Sally Buckner recounts what happened in one classroom at North Carolina State University on the day of Martin Luther King Jr.'s tragic assassination 40 years ago this coming April. James Wallace, instructor for Buckner's history of science class, set aside his lecture notes and delivered an hour-long oration that brought the grieving students to their feet in enthusiastic applause. Wallace's subject -- the despoiling of the earth and the urgency of addressing the problem -- must have seemed unusual at that time, during the urgent struggle to bring down Jim Crow. But today amidst the global crises created by our planet's dwindling resources, amidst dangerously escalating climate change, amidst threats to the very survival of various species including our own, the professor's interpretation of King's teachings appears prescient. Profound words to consider on this day as we honor a great American, and confront the defining crises of our times.